Showing items in category Leeward Islands, sorted by newest listed first. LEEWARD ISLANDS - 1936 2 1/2d rate cover to UK used on LADY NELSON. 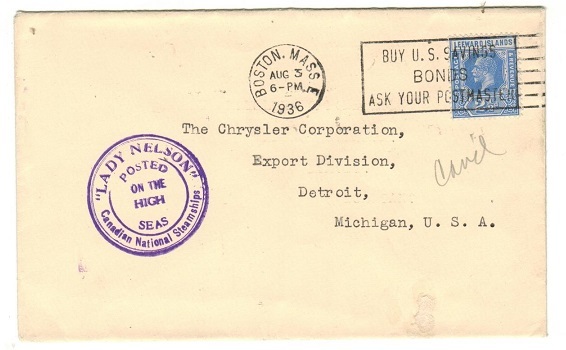 1936 cover addressed to USA bearing Leeward Islands 2 1/2d adhesive tied on arrival by BOSTON-BUY US SAVINGS slogan strike with violet LADY NELSON/POSTED ON THE HIGH SEAS h/s at lower left. 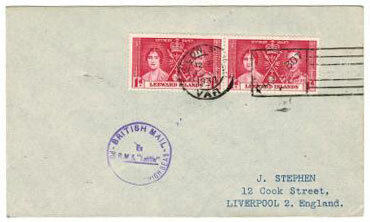 LEEWARD ISLANDS - 1937 'Coronation' cover to UK with maritime bar cancels. 1937 'H & A Wallace' registered cover to UK bearing the Lewward Island 'Coronation' trio tied by unusual double violet BAR cancels. Presumably this was a first day cover carried by ship. 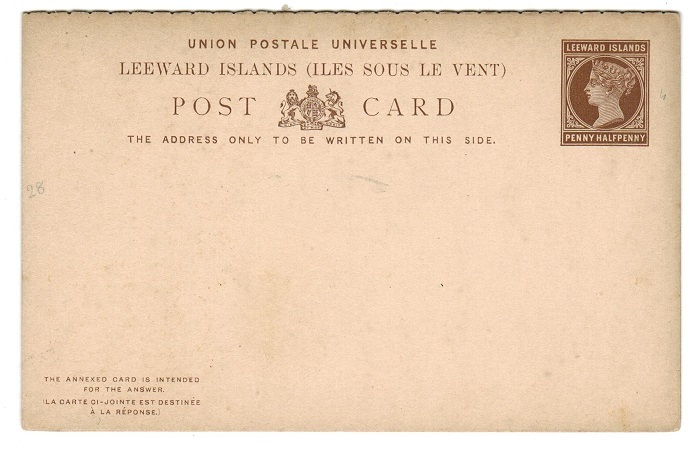 LEEWARD ISLANDS - 1930 (circa) 2 1/2d rate cover to USA used aboard the 'NOVA SCOTIA'. 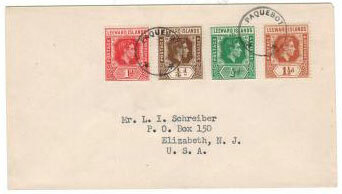 1930 (circa) cover addressed to USA (some tone areas) bearing 2 1/2d adhesive tied by barred duplex with NEW YORK/PAQUEBOT cds alongside dated FEB.27. 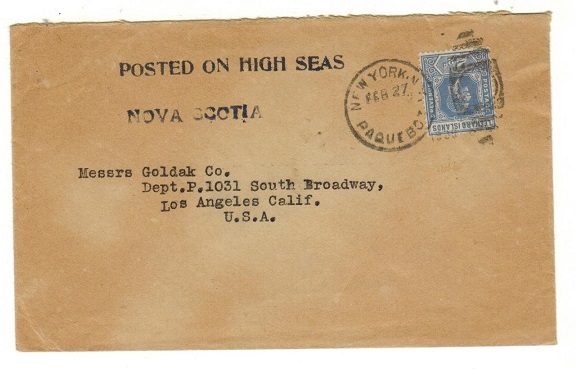 Black straight lined POSTED ON HIGH SEAS h/s applied with NOVA SCOTIA maritime mark. LEEWARD ISLANDS - 1949 1d blue green mint sheet of 60 showing 'REPAIRED DI FLAW'. SG 100. 1949 1d Blue-green 'key plate' adhesive in a superb left hand pane of 60 from PLATE 3 showing the REPARIED DI FLAW on Row 7/3. SG 100. 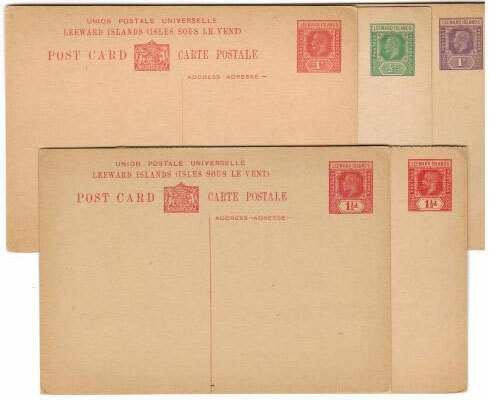 LEEWARD ISLANDS - 1938 3d ultramarine RPSE unused. H&G 6b. 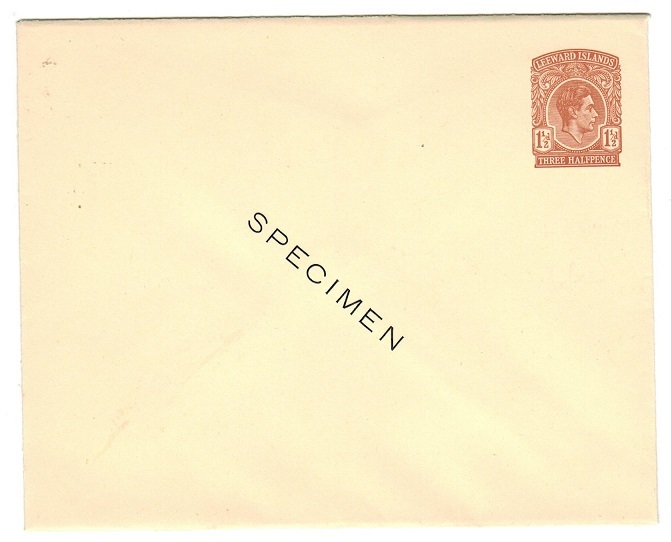 1938 3d ultramarine on cream 'KGVI' registered postal stationery envelope (size H2) in unused condition. H&G 6b. LEEWARD ISLANDS - 1926 3d ultramarine RPSE unsed. H&G 5b. 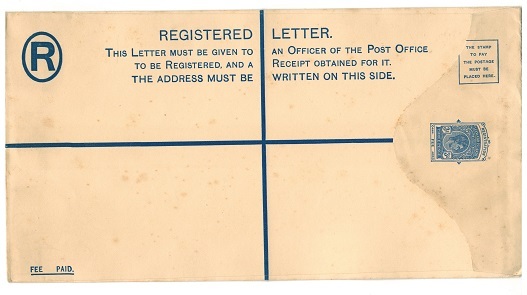 1926 3d Ultramarine registered postal stationery envelope (size H2) in fine unused condition. H&G 5b. 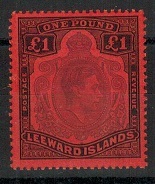 LEEWARD ISLANDS - 1926 1 1/2d red PSE unused. H&G 6. 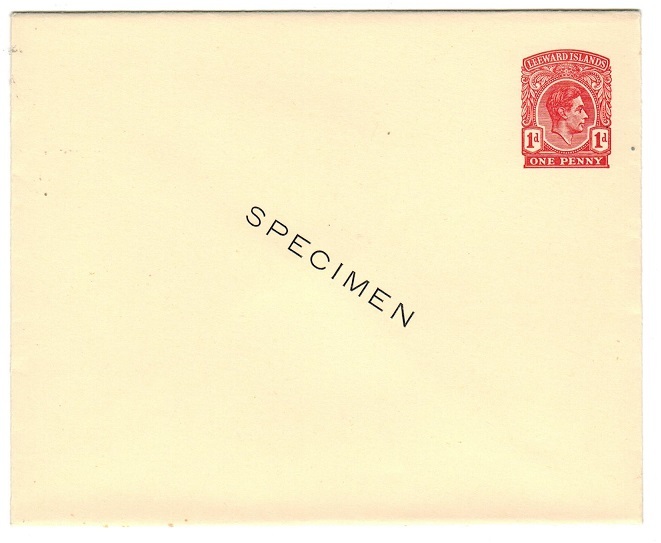 1926 1 1/2d red on cream postal stationery envelope in fine unused condition. H&G 6. 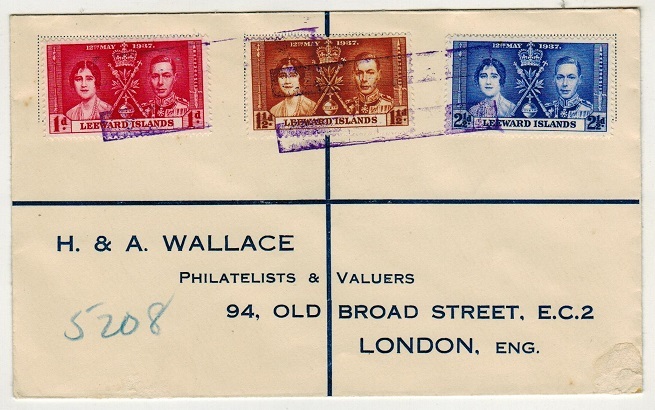 LEEWARD ISLANDS - 1926 1d violet PSE unused. H&G 5. 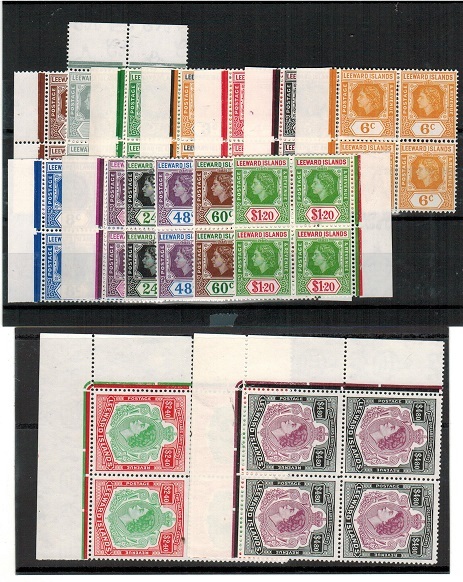 LEEWARD ISLANDS - 1954 series in U/M blocks of four. SG 126-40. 1954 definitive series of 15 values all in fine unmounted mint blocks of four. SG 126-40. LEEWARD ISLANDS - 1935 'Silver Jubilee' set U/M with 1/- having PRINTING LINE FLAW. SG 88-91. 1935 'Silver Jubilee' set of four in fine unmounted mint condition with the 1/- value having an interesting printing fault line running through the bottom from the value tablet to the right frame edge. SG 88-91. LEEWARD ISLANDS - 1944 10/- pale green and dull red on green very fine mint example. SG 113a. 1944 10/- pale green and dull red on green 'key plate' adhesive on ordinary paper in very fine mint condition with only a slight trace of a hinge mark. SG 113a. LEEWARD ISLANDS - 1942 2d slate grey mint with VALUE TABLET LINE INDENTATION. SG 103a. 1942 2d slate grey adhesive in fine mint condition showing the INDENTATION TO VALUE FRAME LINE ABOVE 2d. Row 10/6. Complete with an additional 2d showing the line above 2d thinned at left. SG 103a. LEEWARD ISLANDS - 1938 3d ultramarine RPSE (size K) unused. H&G 6c. 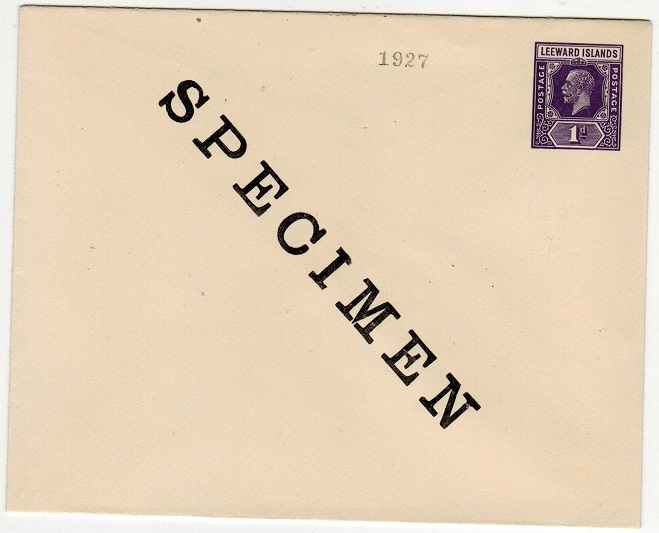 1938 3d ultramarine on cream registered postal stationery envelope (size K) in unused condition. 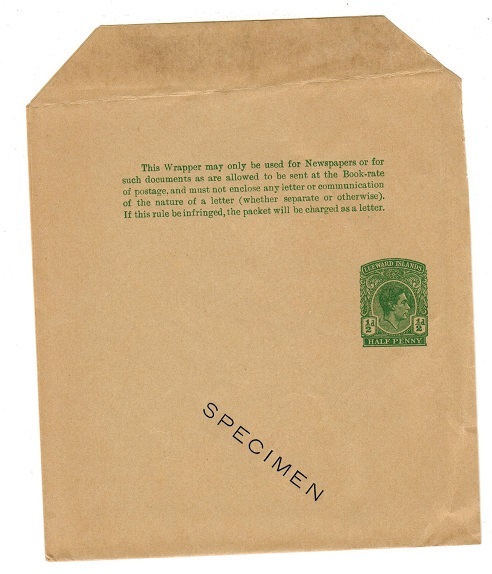 Some light damp marks but the flap is unstuck and this is a scarce 'KGVI' sized stationery. H&G 6c. LEEWARD ISLANDS - 1926 1 1/2d red (ex archives) PSE SPECIMEN. H&G 6. 1926 1 1/2d red on cream postal stationery envelope in fine unused condition handstamped diagonally SPECIMEN in black and with archive '1927' struck at top edge. (Ex Archives). H&G 6. LEEWARD ISLANDS - 1926 1d violet (ex archives) PSE SPECIMEN. H&G 5. 1926 1d violet on cream postal stationery envelope in fine unused condition handstamped diagonally SPECIMEN in black and with archive '1927' struck at top edge. (Ex Archives). H&G 5. LEEWARD ISLANDS - 1938 1/2d green postal stationery wrapper SPECIMEN. H&G 8. 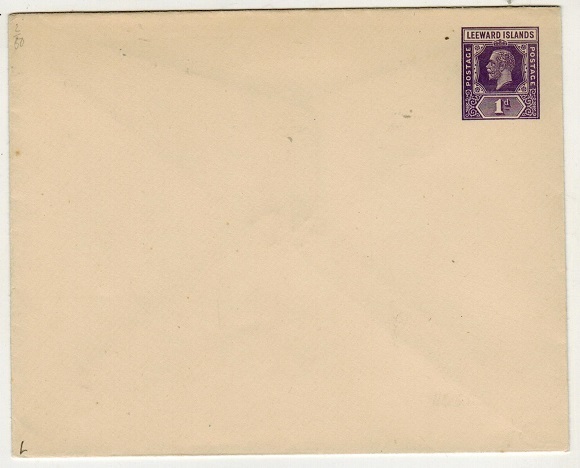 1938 1/2d green on buff postal stationery wrapper in unused condition struck with black diagonal SPECIMEN overprint. Very scarce. H&G 8. 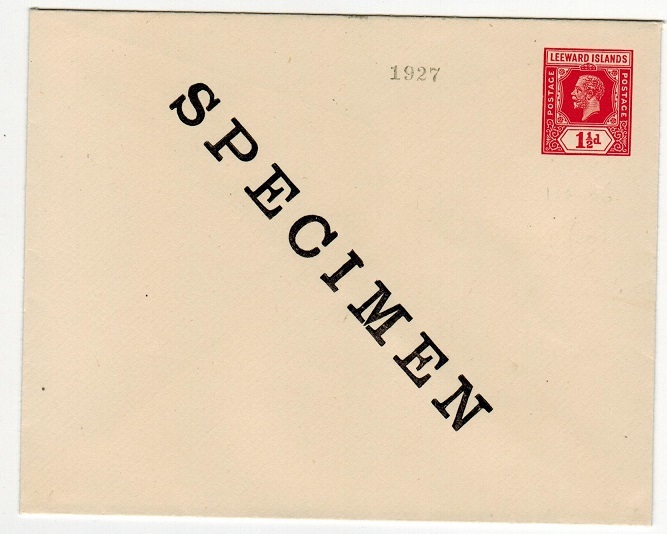 LEEWARD ISLANDS - 1938 1d red PSC SPECIMEN. H&G 17. 1938 1d red on buff postal stationery postcard in fine unused condition with black diagonal SPECIMEN overprint applied to front. H&G 17. 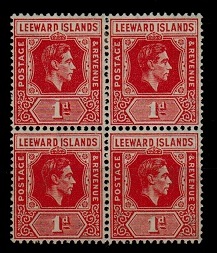 LEEWARD ISLANDS - 1938 1d red PSC unused. H&G 17. 1938 1d red on buff postal stationery postcard in fine unused condition. H&G 17. LEEWARD ISLANDS - 1931 1/2d COIL JOIN mint pair. SG 82. 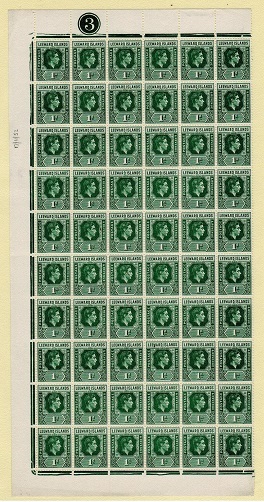 1931-32 1/2d blue-green 'script watermark' adhesive from the revised Die I from plate 23 in a very fine mint vertical COIL JOIN pair. A very rare format. SG 82. LEEWARD ISLANDS - 1938 1 1/2d PSE unused with SPECIMEN in black. 1938 1 1/2d chestnut-brown on cream 'KGVI' postal stationery envelope (133x108mm) in fine unused condition handstamped SPECIMEN diagonally on front. Unlisted by H&G. LEEWARD ISLANDS - 1938 1d PSE unused with SPECIMEN in black. 1938 1d red on cream 'KGVI' postal stationery envelope (133x108mm) in fine unused condition handstamped SPECIMEN diagonally on front. Unlisted by H&G. 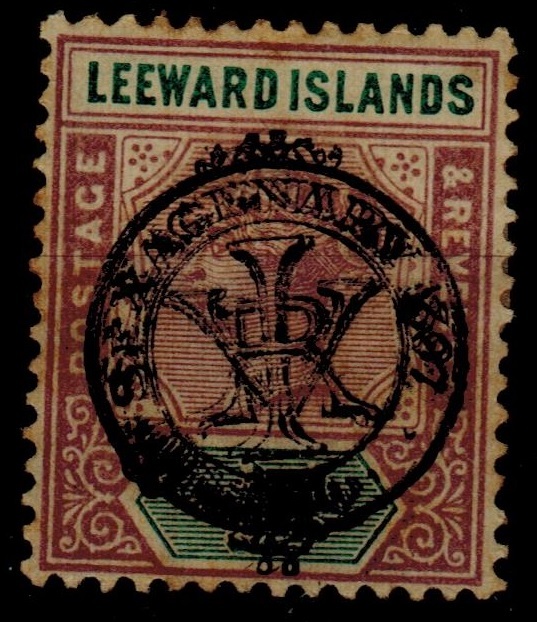 LEEWARD ISLANDS - 1897 1/2d 'Sexagenary' mint with DOUBLE OVERPRINT. SG 9a. 1897 1/2d dull mauve and green 'Sexagenary' adhesive in mint condition but with toned flat gum and with hinge remaining showing the variety OVERPRINT DOUBLE. Cannot be guaranteed so sold 'as is'. SG 9a. LEEWARD ISLANDS - 1952 £1 violet and black adhesive in fine mint condition. H&G 114c. 1952 £1 violet and black on scarlet paper (Perf 13) in very fine mint condition. SG 114c. LEEWARD ISLANDS - 1891 1 1/2d + 1 1/2d brown on buff PSRC unused. H&G 4. 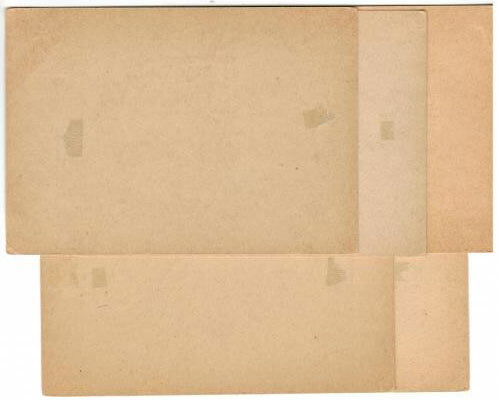 1891 1 1/2d+ 1 1/2d brown on buff postal stationery reply postcard unused. H&G 4. 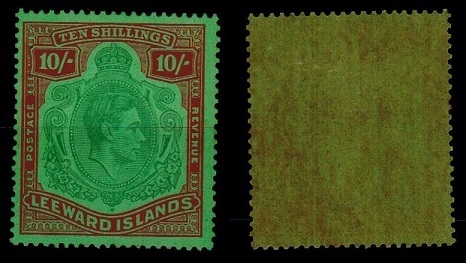 LEEWARD ISLANDS - 1897 1d 'Sexagenary' mint pair with one stamp with DOUBLE OVERPRINT. SG 10a. 1897 1d dull mauve and rose 'Sexagenary' issue in a fine mint marginal pair with the right hand stamp showing the OVERPRINT DOUBLED. SG 10a. LEEWARD ISLANDS - 1948 1d red mint block of four with DI FLAW. SG 99ca. 1948 1d red in a very fine fresh mint block of four showing the major variety DI FLAW. Row 7/3 of the left pane. SG 99ca. LEEWARD ISLANDS - 1940 'key plate' PAQUEBOT cover. 1940 Circa cover addressed USA bearing key plate 1/4d, 1/2d, 1d & 1 1/2d adhesives tied by two starred PAQUEBOT cancels. A colourful attractive item. 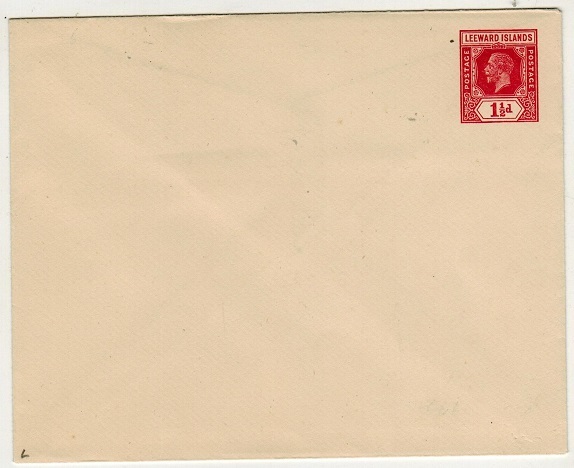 LEEWARD ISLANDS - 1938 TOULON PAQUEBOT cover. 1938 cover to UK bearing Leeward 1d `Coronation' pair tied by TOULON/PAQUEBOT strike with violet BRITISH MAIL/R.M.S.LETITIA maritime h/s below. 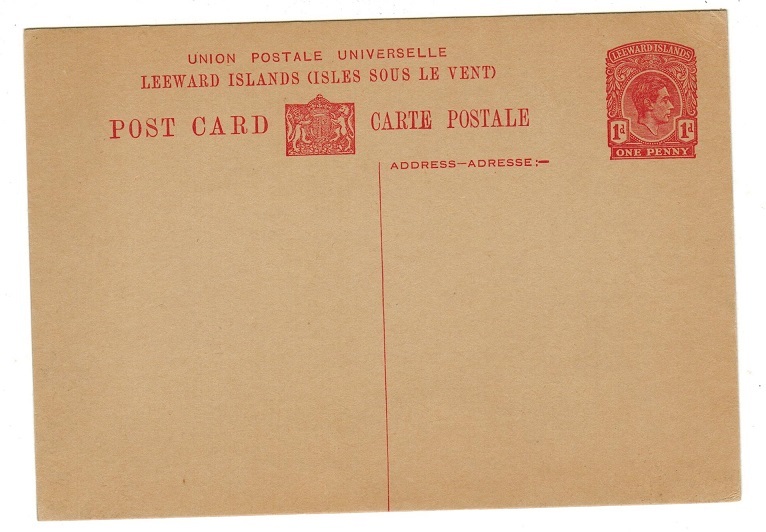 LEEWARD ISLANDS - Range of unused 'GV' Postal Stationery. 5 Items. H&G 8-11 + 14. 1915-1926 small range of 'GV' postal stationery postcards in fine unused condition (light hinge marks on reverse from mounting) with 1915 1d red, 1926 1/2d green, 1d violet and 1 1/2d red, plus the 1 1/2d + 1 1/2d reply card. 5 items. H&G 8-11 and 14.